Are you tired of cutting your food with dull knives? Or do the blades of your current slicer always fall apart? Struggle no longer. With a highly functional mandoline slicer, you get to live your healthiest life every day with faster prep and even faster clean-up. It doesn’t matter if you’re craving zucchini spaghetti straps, or scalloped potatoes, our selection of the best mandoline slicers is there to take you every step of the way, one great slice at a time. Your delicious meals such as summer salads, veggie pasta, and meal preps are just slices away. The Mueller Austria Mandoline Slicer tops our list as the best mandoline slicer manufactured by one of the leading kitchen equipment and utensils manufacturers in Germany. The use of a professional v-shape blade by the Mueller model results in the natural and rapid creation of various slicing styles for your various garnishing needs. All plastic parts of the Mueller Mandoline slicer are constructed from BPA-free, food-grade ABS plastic, while 420-grade surgical quality stainless steel is used for the production of its blades. The rotation of this appliances’ control knob is all you need to adjust your slicing style or thickness. 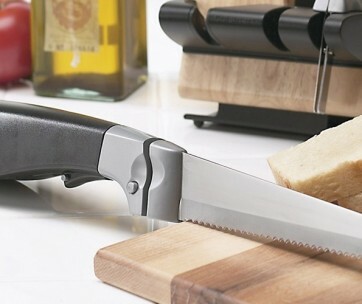 With a lifetime warranty assured to every potential user, this mandolin slicer can be placed in a dishwasher with no issues, and also comes fully equipped with different blades and slicing choices for all your cutting needs, from julienne cuts to slicing, grating and even cross-cuts of perfection. Other additional features that make the Mueller an exceptional appliance are its inclusive 1.5L container, non-skid base, cleaning brush and cut resistant kitchen glove, including upon purchase. A perfect gift for foodies in your life. Avoid injury and enjoy perfect slices every time with the Prep Naturals Adjustable Mandoline Slicer. 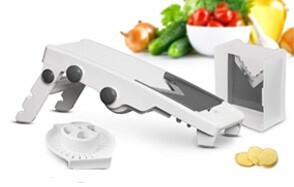 This mandoline cutter is not like the average slicer; it is everything they are not and more. The Prep Naturals slicer is an improved design of the traditional mandolin cutter and as such, features solutions to all problems experienced by people while using other slicers. This appliance is excellent for grating, cutting and julienne slicing, with sturdy and interchangeable blades added in the package to support every action. Every blade included in the Prep Naturals package is engineered to offer you nothing but the perfect slice every time. This vegetable slicer is everything you need in your kitchen and more. With its three different thickness settings, easy thumb-dial control and bonus spiralizer which provides three bonus spiral settings, the adjustable slicer from Prep Naturals works effortlessly as a vegetable peeler, onion cutter, and garlic chopper. A kitchen gadget definitely worthy of having. Another efficient slicing appliance on the market today is the OXO 1155700, a Good Grips v-blade mandoline slicer. This v slicer features four slice thickness settings that can be adjusted with ease. The thickness options include 1.5mm, 3mm, 4.5mm, and 6mm. all blades provided with this mandolin slicer are constructed from sharp, hardened stainless steel, a material sturdy enough to cut both soft fruits such as tomatoes and firm vegetables such as potatoes quickly and easily. Make your French Fries or julienne strips with the OXO’s julienne blades, or create straight and crinkle cuts of plants with the straight and wavy edges respectively. The OXO mandolin veggie slicer features a textured runway that prevents your food from sticking and a food holder that maintains a good grip on your food while offering your fingers with adequate protection. For both compact and safe storage of your slicer, you can quickly close the mandolin lock and fold in its feet. These features also make your slicer extremely portable. For cleaning, the OXO slicer’s body and its food holder allow for top-rack dishwashing, while the blades demand to be hand washed. The handle of this appliance is soft, just like its turning knob, and this enables users to experience comfort at all times. If you need a gift for men who love to eat, this might be the one. The Bron Coucke Classic Chef’s Mandoline is an original stainless steel mandolin slicer designed and built for professionals in France. It feels right at home in the heart of any gourmet lover’s kitchen, offering to slice, waffle, chip or ripple cut anything you want. The Classic chef’s model is a modern version of the original, which makes use of stainless steel for the manufacturing of its blades. Ambrunn Bron, the world’s original mandolin manufacturer, is the founder of a brand that seeks to provide culinary creatives with a versatile appliance that can slice cucumbers or julienne carrots with no complaints. Cut all your hard foods such as pears and apples, and have no issue with vegetables, meat or cheese, thanks to the multitude of slicing options offered by the Bron Coucke slicer. All blades and components of this slicer are produced to help you create all your favorite recipes conveniently, be it grated zucchini, waffle fries or paper-thin sliced Gruyere. This slicer features three distinct blades for various cutting methods, a stainless steel construction, a comfortable ergonomic design, hand-operated levers, a plastic safety guard, and a one-year warranty. It is advised that users hand wash this slicer for ultimate results. If you love BBQ, this tool will come in handy for amazing salads you like to combine with meat. The Swissmar Borner Mandoline V is yet another product we highly recommend, due to its impressive features and construction. There are different blades included in the Swissmar package, and each features sturdy, stainless steel construction. The surgical grade blades are made in Germany and are the perfect design for all kinds of cuts, slice thicknesses, julienne, or shredding. This kitchen mandoline is extremely easy to use, thanks to its ambidextrous food safety holder, a feature that offers users with complete control and protection every time they use their slicer. You will forget about your kitchen knives, at least when the salad is concerned. To hold the food being cut securely, the Swissmar Borner Mandoline V comes with prongs, while the guard keeps your hands away, protected from the blades. The V-Prep V-Slicer features the multifunctional bowl designed by Swissmar and the efficient slicer from Borner. Every feature included in this collaborated design ensures that users are kept safe, and can use their appliances without any specialized knowledge. To store your slicer, you can place the body into the multi-functional bowl that also catches all your sliced items. This bowl comes with a lid; thus, storage will be compact and convenient. You can purchase this slicer from Swissmar Borner for all your friends who love spending extra time in the kitchen; their cooking will never be the same again. If you’re looking for the best appliance for healthy cooking, you should try the Liba Mandoline Slicer. There’s no other kitchen slicer on the market good enough to redesign your food, turning bland and boring vegetables into mouth-watering recipe ingredients. It does all this and more with no more than five slicer settings. When using this blade, all foods being cut are kept chemical-free and clean, thanks to the slicer’s food-safe ABS plastic construction. The Liba slicer is known to be one of the safest slicers on the market, and the brand does not compromise on this in any way. 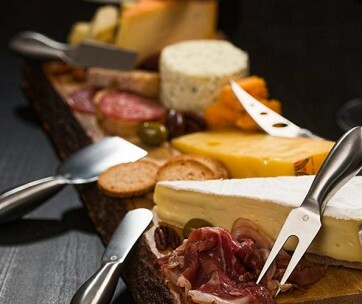 Save all your fingers by using the finger saving slice guards included upon your purchase, and maintain your balance and that of your slicer with Liba’s slip-resistant rubber footing, built to prevent accidents from occurring. The Liba slicer takes you straight into the heart of 21st-century cooking, a culinary century characterized by quick cooking methods and quick food preparations. Split your cooking time into half by using the Liba mandoline slicer. Its high-grade stainless steel designed, combined with the power of its durable blades make it sturdy enough for any commercial kitchen, or the counter of any dedicated home cook. Instead of constantly using a bread knife for vegetables, get this mandoline and make your life easier. Welcome to the Kyocera Advanced Ceramic Mandoline slicer, a Japanese mandoline. The Kyocera makes use of the brand’s proprietary zirconia material for the construction of its ceramic blades, and this offers exceptional durability and quality for extended periods. The Kyocera slicer features edges that will never brown food, a lightweight design, easy to clean parts, and blades that are resistant to acids and are also rust-proof. One exceptional advantage of ceramic knives over their stainless steel counterparts is their durability. Ceramic blades are ultra-sharp, and purely-advanced, and are designed to maintain their edge up to ten times longer than any steel blade. The Kyocera mandolin slicer is the best slicer in the business, as it comes highly recommended by both home chefs and commercial kitchens. It includes features such as a handguard and corner notches that protect the user and bowl containing your cut food. The adjustable dial of the Kyocera helps cooks achieve horizontal and even slices in four different ways and thicknesses. This appliance is a no setup slicer ergonomically designed for the fast cutting of your onions, cucumbers, potatoes, cabbages, carrots, cheese and many more. For more great kitchen products check out our guide to the best vegetable peelers. Made from BPA-free plastic and handcrafted Japanese stainless steel blades, the old version of the Benriner Slicer is a worldwide favorite of kitchen tools for more natural food preparation, as it helps many cooks save a lot of time during food preparation. With this adjustable mandoline slicer in your kitchen, all your vegetables and fruits will be cut with ease into fine and even slices, just like the slices of professional chefs. Get ready to prepare extra tasty and healthy snacks, or dishes such as casseroles, stir-frys, and some vegetarian recipes in your slow cooker. You can use your Benriner slicer to also cut vegetables for garnishing and salad topping, among other uses. This old version of the Benriner slicer is safe and secure to use, and it features elements such as a safety guard for the protection of your fingers, a non-skid rubber base for extra stability and a large, comfortable handle for easy handling. Cleaning is made exceptionally easy, with your slicer being suitable for top rack dishwashing. It doesn’t matter if you’re craving zucchini spaghetti straps, or scalloped potatoes, the Benriner slicer is there to take you every step of the way, one great slice at a time. The Progressive International Mandoline slicer, with its superior quality and sturdy construction, is on our list of recommendations for the best slicers on the market today. Not only is this appliance robust, but it is also safe to use, and simple in design. From delicate julienned carrots to delicious gratins, the mandolin slicer from Progressive International is considered a must-have in every kitchen. Always keep your guests impressed with your thick and thin waffle cuts with this slicer. All it requires is the simple and quick turn of the wrist. Its advanced adjustable knob provides manual settings for this appliance. The PL8-1000 is a professional mandoline slicer with integrated slices and an extra-wide stainless steel slicing deck, designed to allow the effortless gliding of food. For your convenience, this slicer is dishwasher safe, and it also features non-skid feet that make storage very easy every time. Slice up the most delicate vegetables and fruits with ease whenever you use the Progressive International slicer. This slicer is a great gift for all home gourmet cook (especially for your electric pressure cooker) and professional chefs searching for the ultimate mandolin slicer. It is an affordable, durable, simple and highly effective kitchen appliance to cater for all their slicing needs. The newer model of the Benriner Mandoline Slicer is our final recommendation for all cooks around the world. For even cooking and great, mouth-watering foods, this slicing appliance quickly and easily slices all your vegetables and fruits into consistent sizes and pieces. It is the ultimate cooking companion, featuring a sturdy construction with a body made from BPA-free plastic and blades manufactured from handcrafted Japanese stainless steel blades. The stability of this adjustable mandoline slicer is assured by manufacturers through the inclusion of a non-skid rubber base in the design, with a large handle provided for extra comfort during its use. The Benriner mandolin slicer features four interchangeable blades that made chunky cuts, wide slices, extra-narrow, and long narrow julienne strips. To protect your fingers whenever you use this appliance, the Benriner slicer holds all smaller food pieces with its safety guard and also hooks onto the bowl to collect the various slices. To adjust the thickness of the slices, an easy-turn dial forms a part of the slicer’s overall design. The many exceptional features of this mandolin slicer are a part of its overall plan to help you save time when you’re prepping food. The Benriner brand is known all around the world as the producer of the must-have food prep tool for many restaurants and hotels. With their high quality and allure, this brand slowly made itself known in the comfort of many homes. Another great guide we offer is our guide to the best spiralizers so check it out. Brand - Brands such as Benriner and OXO were recommended above to offer readers with high-quality options to choose from. Quality - All products recommended featured class concerning their construction, materials and additional features. They are all sturdy and extremely durable. Reviews - Many user reviews were analyzed when curating this list, to ensure that nothing but the best products were selected and recommended to readers. Price - The price of your mandoline slicer is another vital factor that is taken into consideration when creating the above list. Products with varying prices were selected and recommended, to ensure that all kinds of users would have an available option. Cutting Guard - Most often, the cutting/slicing parts of slicers tend to be very sharp thus, having a slicer with no form of protection will be a recipe for disaster. When selecting a mandolin slicer, you must take into consideration the existing of safety features such as a cutting guard. This element is responsible for the gripping of food during the cutting process, ensuring that it gets appropriately sliced and also that your hands are protected from the blades. Ease of Cleaning - Cleaning of your slicer is a significant activity, as they often get tainted with some form of residue when used. If the waste isn't cleaned or gotten rid of, it might damage your appliance in the long run. It is advised that you opt for a slicer that enables the use of a standard dishwasher. Blade Material - There are two significant blade materials used to make the slicing parts of a mandolin slicer; ceramic and high-grade stainless steel. Both are resistant to rust, sturdy, ultra-sharp and durable. However, blades made from ceramic are up to ten times stronger and durable than their stainless steel counterparts. Any mandolin slicer with blades made from these materials is an ideal choice for your commercial or domestic kitchen. Blade Type - In general, there are three main blade types: the straight blade, which is the original blade consisting of a single blade. It is still used on some French models and is responsible for the straight cutting of ingredients. It is a bit tough on delicate vegetables such as tomatoes, as it requires a lot of force. 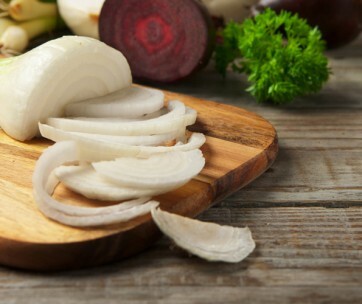 The v-slice blade is another kind of edge often used in slicers unlike its straight counterpart, and the v-slicer works well on all produce, even the delicate ones with tough skins. It is the most prevalent type of blade used in many home-use mandolin slicers. The diagonal blade significantly improves safety by going through vegetables with little force. It is used mostly on Japanese models, and it allows delicate ingredients such as peppers to slide across with ease. 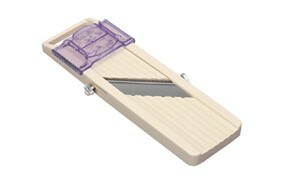 Design - Two essential kinds characterize mandolin slicers; the stand and the flat handheld slicers. With the handheld slicer, the base rests against the counter or bowl, while the user holds the body. With this kind of slicer, the user has control over the slicing angle, offering them with a higher power. 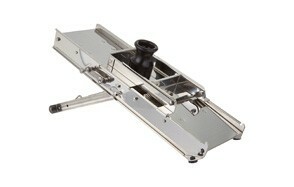 The standing model of slicers can work on its own. Its higher level of sturdiness and safety makes it easy to incorporate extra features like juliennes and waffle cuts. Versatile - When looking for the perfect mandolin slicer, you must consider how versatile the unit is, regarding function. Can it cut through all kinds of ingredients? Does it give you many slicking options, be it thickness or style? Can you cut, grate, and julienne with that same appliance? A versatile slicer is an economical choice as it saves you from spending on other devices. Attachments - All attachments included with your slicer must be easy to swap and maintain over time, without affecting the appliances’ ability to process vegetables or fruits. French - Many culinary school students use the French mandolin to learn. This slicer features a stainless steel surface and a bulky frame with interchangeable blades for a variety of slices and cuts. Japanese - The Japanese slicer is an improved version of the French slicer, being lighter in weight and more affordable. Unlike the straight blades of the French slicer, the Japanese slicer features diagonally set edges which offer a cleaner cut and more control. V-slicer - The V-slicer is an excellent option for soft foods such as tomatoes and peppers. Replace or sharpen your blades regularly. Ensure that your slicer is stable before use. Use manageable pieces for slicing. Wash your slicer diligently and thoroughly. Q: How to Use a Mandoline Slicer? Read all instructions from the manufacturer. Test your slicer to ensure its safety. Use your slicer to your heart's content. Q: What Is the difference between a Mandoline Slicer and A Spiralizer? A: The difference between both appliances is in their function; spiralizers create spiral strands of ingredients, the principal use of any mandoline slicer is to develop different slices of food. Q: Should I choose a stainless steel or plastic Mandoline Slicer? A: Both slicers feature the same functions and are used in the same manner, however, stainless steel slicers are typically more sturdy, durable and less likely to break. A result of their durability is that stainless steel slicer needs more maintenance than their plastic counterparts. Q: Can I clean a Mandoline Slicer in the dishwasher? A: Yes, you can clean your slicer in the dishwasher, depending on the manufacturer's’ instructions.